The bunches of berries can be picked in September. Use secateurs to cut the bunches from the trees. Take care not to damage the parts of the tree that will continue to grow. 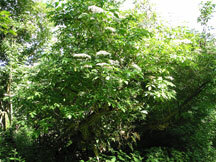 A large number of berries can be collected in a short time. Extract the seeds using a bucket or two, a flat-bottomed pole (for example, an old sawn-off spade handle), a sieve or collander. You’ll also need access to a hosepipe or water supply. The berries are mashed and the waste and seed separated through the sieve. Be gentle on the seeds though! They are delicate. The extracted seed should be mixed with equal parts horticultural sand or a sand/compost mixture (for these seeds the addition of compost to the mixture can help break dormancy). Use 50% leafmould or peat-free compost and 50% horticultural sand. For each handful of seeds add two or three handfuls of mixture. Select a pot that has enough room for this seed/sand mixture (and a bit more) and put a layer of stones in the bottom. Cover the stones with sand. Place the seed/sand mixture on top of this and cover this with 2-3cm sand. Label the pot and stand in a shady spot outdoors. Leave the pot outside for the winter. In February, check for signs of germination. If about 10% are showing signs of germination, they are ready to sow. In a 1-litre pot sow four or five seeds and cover with no more than 5mm of compost or grit. Firm gently and water. On a seedbed broadcast the seed quite densely – aim for about 2-5mm between seeds. Firm with a roller or board to press the seed well into the soil. Cover with 5mm of grit. Elder should be kept moist at all times. 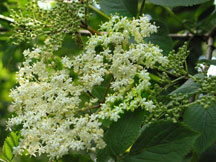 Elder should grow quickly and be ready after either the first or second year for planting out. If you transplant them to grow-on for a further year, make sure they are planted into good, free-draining soil. The roots are very soft and can suffer from root-rot.